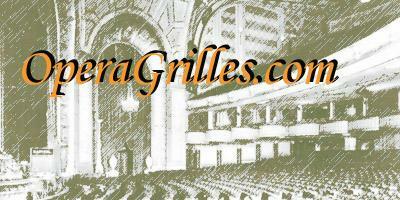 Opera grilles quickly establish a classy look!! Opera grilles are heat registers and/or return air grilles made of cast aluminum.They elegantly capture the romantic elegance of opera houses circa the late 1800's. We provide them in the natural metal, but there is no reason why you can't paint them in your choice of colors. Sizes appropriate for floor use are available without mounting holes. Alternatively, we can drill them and supply screws for those intending to use them in the floor or ceiling. the Phantom - no wonder he never wanted to leave the basement! Turn a dull and boring space into a eye candy - what creations will these beautiful pieces inspire? They will inspire great ideas and picture perfect decorating. When these grilles arrive at your home they will be their basic aluminum color - silvery. Some people like them that way but think about this, if you paint your opera grille the wall color as in the above picture you turn that wall area into an almost instant work of art! Think about this: red wall - red Opera Grille or perhaps paint the opera grill black. The above register is one of our favorites as it reminds us of a beautiful butterfly - sleek and graceful. Think about how graceful and gracious a butterfly is; that is the gracious and graceful look your new grille will add to any room in which you wish to install them. Beverly Sills would sing at the top of her lungs if you invited her into your home and she saw your beautiful vents. They definitely would inspire a beautiful aria from her. Because of the fact that aluminum is a soft metal we recommend these for wall use only or even in the ceiling as long as, of course, you have them securely screwed into the surface. If you want the narrower grilles, that is 6 inches wide or less you may put them in the floor. I spoke with a lady on the phone the other day who was going to talk with her contractor and see what she could do to cover an ENTIRE wall with Opera Grilles!! Now THAT would be a wall with definite interest! What a statement! Another use for these is outside the front or back doors to use for a mat....great for scraping off the drips and dirt from your shoes that would otherwise be brought into the house! Just a thought....but let's go back inside and relax in front of your new grille. Hey let's start a guest list for the housewarming party you are going to have starring your new registers as the main attraction. Close your eyes and picture everyone standing around in awe as you unveil your new grille.......they will be speechless and after a few moments there will be a rousing roar of ooohs and aaaahs. 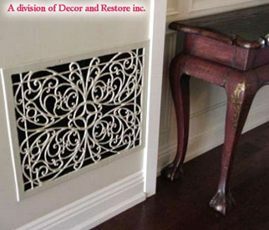 Your guests will be mesmerized and slowly step forward and carefully touch and stare and admire your new vents. They will then raise their glasses and toast this beautiful spectacle. Suddenly the room will be full of chatter as everyone will want to know where you found this gorgeous decorative piece and you will announce loudly and full of pride, "I found them on www.OperaGrilles.com!" There are many sizes to choose from and there are round ones available. Please call us with any questions you might have! Our hours are 10:00 a.m. to 4:00 p.m Pacific Time. We are closed on weekends and holidays.